What are Glueless Lace Wigs? Glueless lace wigs are modified full lace wigs that don't require any special attachments such as glues, tapes or bonds - Hence the term "Glueless Wig". A glueless lace wig is very simple to apply, not to mention one size fits all. It is made with an adjustable strap in the back of the head and the front has a ribbon that runs along the perimeter of the hair line. The hair is under vented into the ribbon creating a soft looking natural hair line. The lace is not extended beyond the ribbon and under venting is used for naturalness of the glueless lace cap. Glueless lace wigs are preferred by many women that don't want to bother with messy attachment methods using glues and want to remove their lace wig nightly. It's simple to apply and provides a comfortable tight hold with the all the benefits of a natural appearing lace wig. 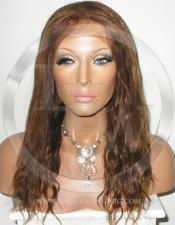 We carry the best selection glueless lace wigs available in various colors, textures, and lengths. You get the best quality human remy hair glueless wig for the cheapest price because you are buying directly from the manufacture. You don't have to wait! If you order today, you can have your beautiful Glueless Lace Wig tomorrow. Our glueless lace wig makes the application process easy and fast - There's no messy glues, bonds or tape to deal with during application. All of our hair is hand tied into the lace strand by strand giving you a natural appearance. 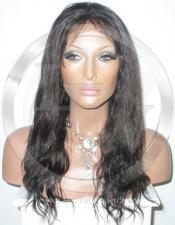 All of our glueless lace wigs are available in Indian Remy, Chinese Virgin or Indian Virgin remy hair.. 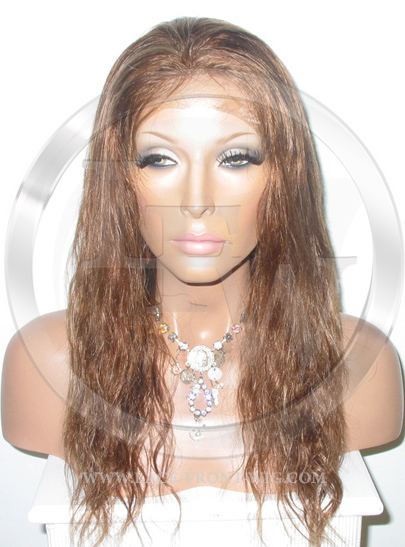 The glueless lace wig is the easiest lace wig to wear and maintain. It provides a secure hold with adjustable straps. There's NO tangling of remy hair since the cuticles run in the same direction. There's minimal shedding of human hair since we use a knot sealer and double knots in back of the cap. Why should I choose a glueless lace wig over other types of lace wigs? In short, glueless lace wigs are your best choice if you're looking for a natural, beautiful, versatile and secure lace wig without the use of tape, glue or bonds. For those that want a beautiful, glamorous lace wig without using any glue, bond or tape then the glueless lace wig is your choice. How secure is a Glueless Full Lace Wig? 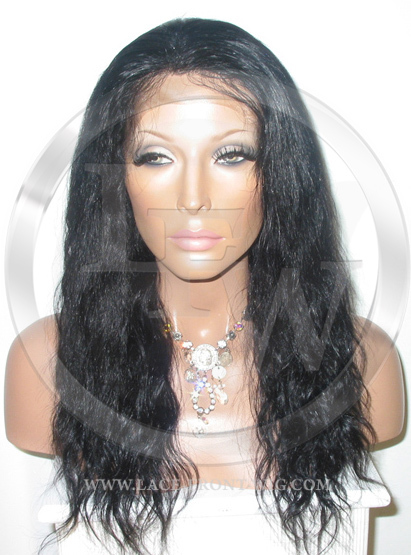 Glueless full lace wigs are secure and comfortable. They have an adjustable strap in the back to conform securely to your head. You can wear them without using lace tape, glue or bond. You can also secure them to your own existing hair by using hair clips sewn into the inside of the cap. Can I shower and swim with a glueless full lace wig? It is not advisable to submerge your head completely in water while wearing your glueless cap. The additional weight of the wet hair may cause a shifting of your cap. However, you can wear it while you shower or swim without submerging your head under water. It is fine for vacationing and lounging in the pool or hot tub. Additionally, if you are caught in a sudden down pour of rain your glueless full lace wig will remain secure and comfortable. Can I wear my Glueless Full Lace Wig for an extended period of time? Most clients prefer to wear their Glueless Full Lace Wigs daily. They simply put it on in the morning and removing it before bed time. While you can sleep in your glueless full lace wig if the need arises, most people prefer not to. Does a Glueless Full Lace Wig look as natural as a Full Lace Wig? While glueless full lace wigs and full lace wigs resemble each other, there are slight differences that can be noticeable based upon the hair style worn. The Glueless Full Lace Wig has an adjustable strap in the back and a small band that runs around the perimeter of the front hair line to secure the cap to the head. This band gives the support necessary to eliminate the need for tape, glue or bond. In order to make the band invisible, the hair is under vented along the perimeter. The result is a soft natural looking hair line but not quite as natural as a full lace wig with bleached knots and baby hair. If you wear your hair down, with bangs or over to the side, there is little difference in appearance. 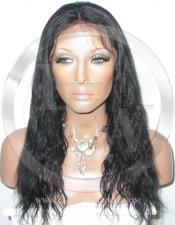 A glueless full lace wig has the advantages of lace without the need of any attachment methods.